Just ahead of world premiere of Rogue One: A Star Wars Story in Hollywood, just down the street the cast and director of the film appeared on Jimmy Kimmel Live. 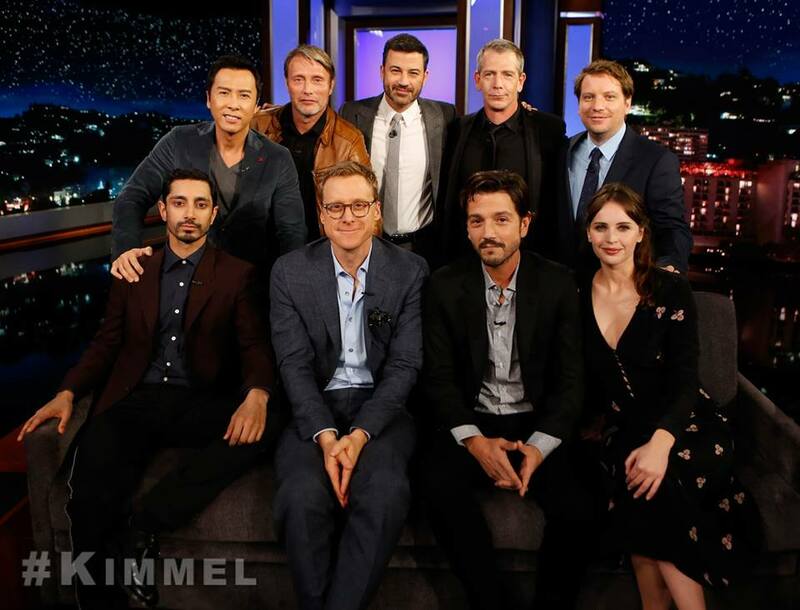 After "arriving" in an X-Wing parked on Hollywood boulevard, the group, which included Felicity Jones(Jyn Erso), Diego Luna(Cassian Andor), Alan Tudyk(K-2SO), Riz Ahmed(Bodhi Rook), Donnie Yen(Chirrut Îmwe), Mads Mikkelsen(Galen Erso), Ben Mendolsohn(Orson Krennic) and director Gareth Edwards, took the stage to discuss a variety of topics and reveal a duo of new clips from Rogue One. The Rogue One premiere is happening today in Hollywood and StarWars.com will be live streaming the event! The film premieres in full on December 16th.